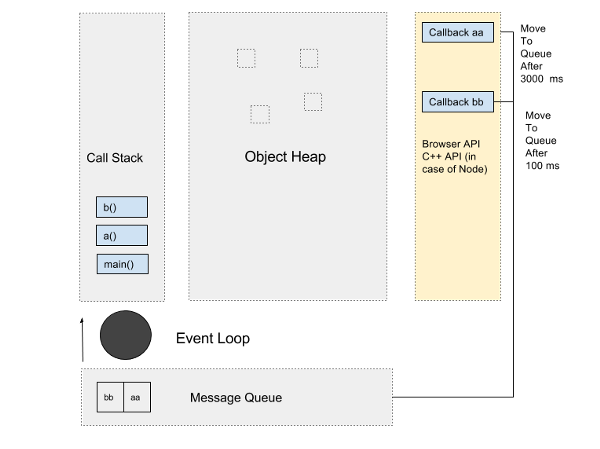 Call Stack — It is the main thread by which execution of our program takes place. During run time, engine creates frames, which contains arguments and variables of that function (not objects) and push them into call stack. main is our entry frame by which execution starts, after that it will create a frame for a and push it into call stack. Inside a we are calling b, so it will create a frame for b and push it into call stack. When execution of any function finishes, it will pop corresponding frame from the call stack. 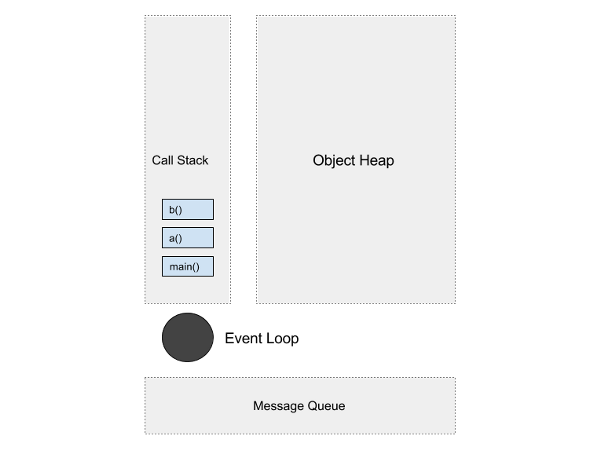 Object Heap — It is nothing but a memory space where objects resides. Now, for some more clarity, let’s extend our example and add some callbacks. We will use ‘web api setTimeout’ to add function aa and bb inside function a and b respectively with timeout 3000ms and 100ms. setTimeout is a web API which is handled by the browser concurrently. You can call web API’s and they will keep working on them in separate thread. Starting with main frame, engine will create frame for function a and push it to call stack and browser start timer for function aa. After that, engine creates frame for function b and pushed it into call stack. Similar as aa, for function bb also, browser kicks a timer for it. On the one hand, the call stack execution is going on and it pops frames from call stack as b, a and then main, and on the other hand at the same time callback timer is ticking. Whichever callback timer completes its duration first (regardless which started first), it will move to the message queue. So, in this case, even though timer for aa started first it is taking more time then bb so in message queue, bb moves before the aa. Now significance of Event Loop comes in picture. Event loop is continuously ticking during the whole process and watching the call stack and message queue. As soon as it finds out that all frames of call stack (a, b and main) are popped and call stack is empty, it started creating frames for callback functions (bb, aa) and pushing them into call stack from message queue. Here you can see event loop waited for the completion of previous call stack before pushing message queue frames to them. It means whatever time we provide in the callback, that is the minimum time which it will take to execute. Why in-app messaging is the best way to engage users today? Instant messaging, a term that entered common usage in the early 1990s, but the concept actually dates back to the mid-1960s. Multi-user operating systems such as the Compatible Time-Sharing System (CTSS),created at Massachusetts Institute of Technology (MIT)’s Computation Center in 1961, allowed up to 30 users to log in at the same time and send messages to each other. The system, which is perhaps closer to what we now think of as email, had hundreds of registered users from MIT and other New England colleges by 1965. Since then, we have come a long way as today we have multiple ways to communicate. In case of buyer – seller interaction, we have options like push notification, in-app messaging, live chat and real time chat. In case, you want to understand the difference please read, “Difference between Real Time Chat, In-App Messages, Live Chat and Push Notifications”. Let us now understand why in-app messaging seems to be the most effective way of buyer- seller interaction. But before that, let me tell you what in-app messaging actually is? By now, you must be thinking,”so what’s the big deal about in-app messaging? Before we dive deeper into the capabilities of in-app messaging, let us draw some understanding from a recent report released by Experian Marketing Solutions. The findings of the report highlighted, “the top initiative for 2016 will be inclusion of in-app messaging”. In fact, they estimated that 44% of marketers will focus on installation of chat option in their application followed by 39% focussing on sms and 38% on push notifications. This study affirms that in-app messaging is on the cusp of widespread adoption, and is primed to create more targeted, purposeful user sessions. In-app message has a higher reach when compared to push notification as it gets rid of the headache of seeking customers consent before sending. In case of push notification, a customer is expected to subscribe to it but only 45% of customers do that. So what are you loosing? A way to engage majority of your users (i.e 55%) and most importantly, a source to enhance your revenue. On the other hand, in-app messaging comes with no constraint as users are guaranteed to receive notification leading to 8X higher response rate than push notifications. In-app messaging is estimated to increase the app launches by 27% and magnify the engagement rate by 3X! It is because in-app messaging allows your customers to move from the grid of users to active customers through higher engagement and customized alerts.The probability of uninstalling your app within 30 days of downloading gets reduced,leading to an increase conversion rate up to 4X. In-app messaging allows you to cater to the customers who already are your users. Thus, it helps marketers to create campaign which are highly targeted for existing users base. On the contrary, push notifications or SMS are often considered as source of invasion. In fact, lot of users have said, that they feel harassed as they continue to receive alerts even after the requirements are met. IP messaging is defined as communications channels that rely on mobile TCP/IP data links for delivery rather than the traditional telephony network. IP messaging allows business to have a complete picture about messages they send. They can easily track if the messages were delivered/not delivered/read/not read.IP Messaging can help business to focus on core activities by reducing investment in marketing and operational activities. The time and cost spent on IP messaging is minimal when compared to sending SMS to that many offline users. However, we are also of the opinion that marketers are yet to exploit the possibilities of in-app messaging as the segment is still in nascent stage. In-app messaging is mainly being used to broadcast generic messages to the entire user base leading to higher churn rates as users considers them to be spammy. Applozic aims to help marketers to create customized campaign for complete communication solution. We help our users to have 1-to- 1, 1-to- many, group chat, context-based chat and sms/email fallback support. Also, we have designed a dashboard with rich insights and analytics to help marketers strategize their campaigns. We aim to create an environment in which our users don’t be a victim of mobile engagement crisis and focus on using in-app messaging tools to combat churn and enhance user experiences.